Welcome to the Omega Enlarger Guide. This site has information on all models of Omega enlargers sold to the public from the very beginning in 1936 to the end of production. You'll also find separate sections on Omega color heads, condenser heads, special purpose lamphouses, analyzers, and timers. There's also a Museum section featuring the very oldest Omega enlargers, a selection of vintage advertising, and even an "easter egg" for those who enjoy a bit of a challenge. On the individual product pages, we've indicated the current availability of each item according to the following legend. Please refer to this chart as you browse the listings. We've attempted to make the information as complete and accurate as possible, but expect that there will be errors and omissions. If you find any, or wish to report technical problems with the site, or submit additional information, please email webmaster@khbphotografix.com. Note that this site has information only on the Omega enlargers designed and manufactured in the USA. 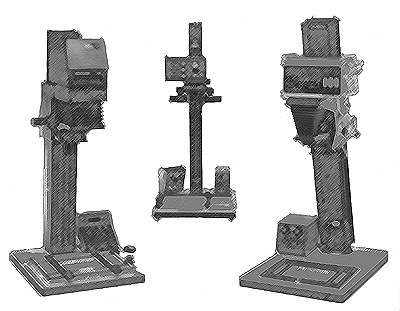 For information on Omega/LPL enlargers, which are manufactured in Japan by LPL and distributed in the United States by OmegaBrandess, please refer to our LPL Enlarger Guide. KHB Photografix stocks an extensive inventory of refurbished Omega enlargers, as well as new and used parts and accessories. Many items are listed in our Online Store. For those enlargers, parts and accessories not listed in our store, please contact us to discuss your requirements. We can also provide copies of User Guides/Instruction Manuals for most of the enlargers featured on this site, as well as many other Omega accessories. Please click here for a list of available manuals and instruction sheets. We welcome submissions from visitors to our site. Before you leave, we invite you to use our Feedback Page to provide your comments. Note: The Omega Enlarger Guide is provided by KHB Photografix as a reference for anyone wishing to learn more about Omega enlargers and darkroom accessories. It is not a resource from which to copy pictures and descriptions. The contents are copyright. Copying of material from this site without permission is prohibited.